For a summary of della Corte’s argument, see Franklin, James T., “Pantomimists at Pompeii: Actius Anicetus and his Troupe,” American Journal of Philology, vol. 108, no. 1 (Spring 1987), pp.97-98, available here on JStor. “Farewell, Actius, master of the stage.” CIL IV. 5399, reprinted in Franklin, pg. 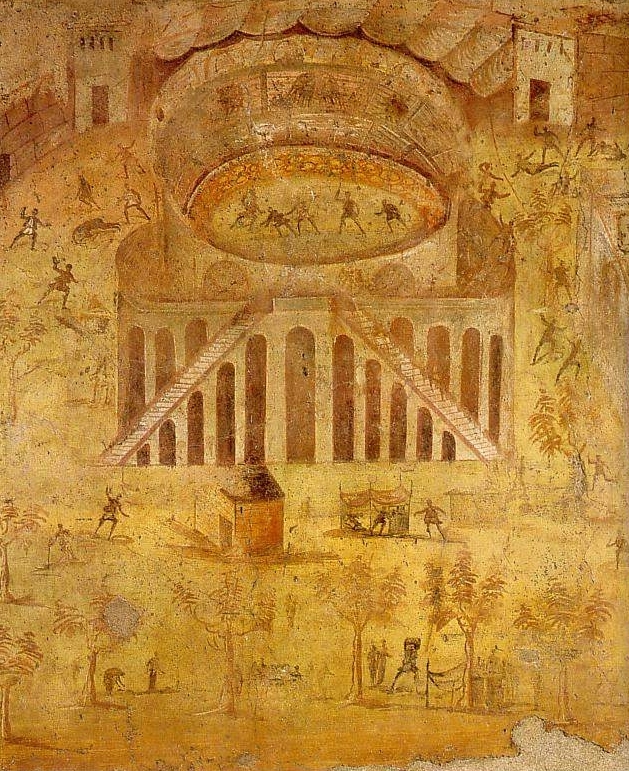 97.
see Moeller, Walter O., “The Riot of A.D. 59 at Pompeii,” Historia: Zeitschrift für alte Geschichte, Bd. 19. H. 1 (Jan. 1970), pp. 84-95. Available here.